With over 70 years in the automotive industry, the Qvale Auto Group has seen its fair share of retail evolutions. Kjell Qvale started in the automobile industry selling Willy’s Jeeps before becoming one of the pioneers of importing foreign cars to America. Founded in 1947, today Qvale Auto Group owns and operates dealerships across the U.S. — from California to Texas and Florida. Since the beginning, they have been committed to providing value, quality and excellence in sales and service; inspired by their customers’ standards and the Qvale family reputation. 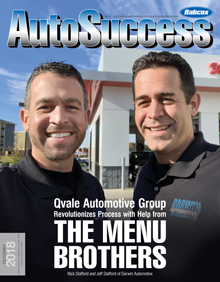 Qvale, as an organization, decided it was time to have a single customer experience for all of their franchises, whether their customers chose to engage them on the web or walk into the dealership directly. The challenge became that none of their current software providers could provide the single solution they were looking for. Qvale, after considering multiple software options that didn’t work, approached Jeff Stafford, chief marketing officer of Darwin Automotive, and suggested that with some custom software enhancements, the Darwin software could be the one solution they were looking for. Jeff and his brother Nick have been known in the industry for over 12 years as “The Menu Brothers,” as they were part of the original team that created one of the first electronic menus in the industry (MenuVantage) over 12 years ago and are back at it today, providing the industry with yet another game changer. Qvale knew that they were onto something that could also be a game changer for their organization. Qvale and Darwin worked together along with engagement and oversight from Audi directly to create a unique customer experience where the customer who engages Qvale on the web and then comes in the dealership is treated the same way. Customers can engage on their phones, tablets or desktops both in and out of the dealership and complete parts of the transaction right from their own home. The core of this approach is a transparent, frictionless, easy customer experience that provides their customers exactly what they are looking for while providing a profitable deal for Qvale — the ultimate win-win. “Through the years, Darwin has proven to be a solid partner, so we were excited to implement their digital retailing solution as a big part of this single experience,” Walsh said. “The other digital retailing tools we looked at weren’t focusing enough on the presentation and personalization of F&I products and the customer experience as much as Darwin was. With F&I being such a large portion of our revenue, we knew this piece of the puzzle would be vital for successfully implementing a digital retailing solution. In addition, Darwin has also recently launched a product they refer to as Darwin Direct, which allows a dealer to personally follow up with customers who didn’t purchase F&I protection and give the customer the ability to purchase that protection straight on the dealer’s website via Paypal or Service Payment Plan’s zero percent financing. Click here to view more solutions from Phil Battista and Darwin Automotive.